Mary Martin was one of the greatest stars of her day. Growing up in Texas, she was married early to Benjamin Hagman and gave birth to her first child, Larry Hagman. She was divorced even more quickly. Martin left little Larry with her parents and took off for Hollywood. She didn't make a dent in the movie industry and was lured to New York where she found herself auditioning for Cole Porter and his new show "Leave It to Me!". After she sang the bawdy "My Heart Belongs to Daddy", she ended up on the cover of Life magazine. Six years later, she became the Toast of Broadway when she starred in "South Pacific". After that, she flew as "Peter Pan", yodeled in "The Sound of Music", took "Hello, Dolly!" on the road and shared a four-poster with Robert Preston in "I Do! I Do!". Her personal life was just as interesting: In NYC, she met and married Richard Halliday, a closeted upper-class homosexual who adored her, Broadway and interior decorating (though probably not in that order). They were a powerful twosome. There were rumors about Martin, too, being in a lesbian relationship with both Janet Gaynor and Jean Arthur. 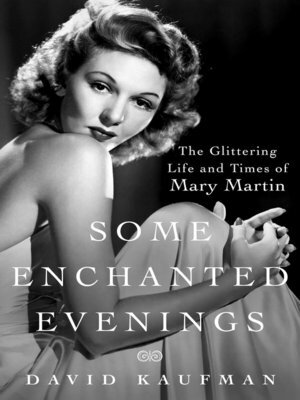 Peopled with legends like Ethel Merman, Ezio Pinza, Noel Coward and a starry cast of thousands, David Kaufman's "Some Enchanted Evenings" is the delectable story of the one and only Mary Martin, a woman who described herself as a chicken farmer from Texas only to become Peter Pan and capture America's heart. DAVID KAUFMAN is the bestselling author of Doris Day: The Untold Story of the Girl Next Door as well as a long-time theater critic and contributor to The New York Times, The Nation, and Vanity Fair. He lives in New York City.